Margaret Parsons Weber, 95, of Carmel passed away Sunday, October 2, 2016, at Kindred Transitional Care & Rehabilitation – Bridgewater in Carmel. She was born on May 23, 1921, in Bardstown, KY to the late Lloyd M. and Ellen M. (Wathan) Parsons. 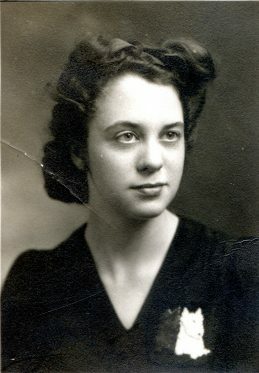 She was a 1939 graduate of Shawnee High School in Louisville and had attended Business College in Louisville. She married Leo H. “Bud” Weber on November 22, 1947 and he preceded her in death on December 1, 1974. Margaret was a secretary for Wood Mosaic Company. Margaret was a full-time homemaker after her first daughter Karen was born, and enjoyed reading, listening to music, spending time with family and friends, and working in her yard. She and her family moved to Frankfort, IN in 1964, where she resided until 1998. She was also a resident of St. Joseph Center, Tipton, and Sanders Glen Retirement Community, Westfield. She especially enjoyed caring for her grandson, Matt, during his preschool years. She was a devoted, lifelong Catholic, and was a parishioner of St. Mary’s Catholic Church in Frankfort from 1964 to 1998. Memorial donations may be made in Margaret’s honor to St. Mary’s Catholic Church in Frankfort or the charity of your choice with envelopes available at the funeral home. A memorial service will be held at 11 a.m. Saturday, October 8, 2016 at Archer-Weston Funeral & Cremation Center in Frankfort. Father Chris Miller will officiate. Burial will follow in Green Lawn Memorial Park. She is survived by her daughter: Karen L. (Bill) Mullin, Sheridan, IN; grandson: Matthew L. Ottinger and his fiancé: Katie Coffin of Greenfield, IN; daughter: Rebecca W. (Jeff) Wittrock of Fishers, IN; grandson: John (Jack) W. Wittrock of Fishers, IN; niece and nephews: Ellen (Mike) Buckman Phillips of Dawsonville, GA, Tim (Sharon) Buckman of Borden, IN, Bob (Martha) Sundberg of Louisville, KY, Nick (Chris) Sundberg of Louisville, KY, and several great nieces and great nephews. In addition to her husband Bud, she was preceded in death by her sister: Catherine L. (Parsons) Buckman; brother: William H. Parsons; and nephew: Robert “Bobby” Buckman, Jr. She was also preceded in death by dear friends Mary Jo Davis, Mary Eiden, sister-in-law: Mildred Sundberg; cousins: Mike and Doris Weber; and neighbors, John and Alma Pence, and Bernard and Charlotte Stoops. Karen and Bill, Becky and Jeff.. Our deepest sympathy on Margaret’s passing. I am sorry to hear of the loss of our aunt .thinking of you now and for ever . joyce l. parsons Murley , and Barbara parsons , and the rest of the PARSONS family . I am very sorry for you loss. Your family is in my prayers. We send our condolences and love.